The lightweight Copperhead 1500 is an easy to use rangefinder with a clean display and highly intuitive menu that quickly and accurately ranges targets from 9 to 1500 yards. The Primary Horizontal Component Distance (HCD) mode provides an angle–compensated distance reading because we know you don’t always hunt on flat ground. 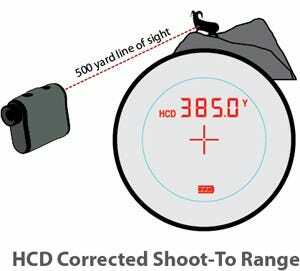 The Copperhead 1500 uses HCD (Horizontal Component Distance) angle-compensated ranging technology to give bow and rifle shooters the critical distance data needed to make accurate shots.